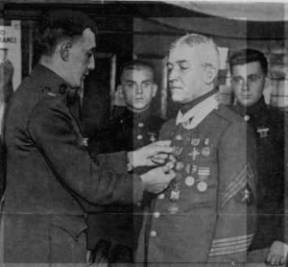 In August 14, 1900, a U.S. Marine by the name of Daniel J. Daly so distinguished himself by his gallant conduct in the Battle of Peking, during the Boxer Rebellion, that he was awarded the Congressional Medal of Honor. Fifteen years later on October 25, 1915, in the capture of Fort Liberte, Haiti, he won a second Medal of Honor for his valorous actions. By now a legend in the Corps, he was amongst the “first to fight” in World War I. For his gallantry and heroism during that conflict he was decorated by the U.S. Army, the U.S. Navy and the French government which bestowed on him the Croix de Guerre. Many years later, in World War II, the U.S. Navy remembered that Marine’s brave exploits by naming a fighting ship in his honor. Early in 1943 a young navy commander, fresh from duty at U.S. Fleet Headquarters in Washington, D.C., took command of the destroyer USS. Daly (DD-519). The ship was in its final stage of completion and was commissioned on March 10, 1943. Daly’s skipper together with her officers and men immediately set about molding themselves into an efficient fighting unit of the Navy. Within weeks the “tincan”, as these thin-hulled vessels are called, found herself on patrol in the Atlantic off the coast of Newfoundland. By the end of June 1943 she was enroute to the Pacific. In August she participated in the invasion of Kiska in the Aleutians and remained in Alaskan waters for several months on patrol. Late in the year she sailed south to warmer waters. On the day after Christmas her gunners drew enemy blood by downing two attacking Japanese bombers during an assault on Cape Glousester, New Britain. In that operation her sister ship, USS. Brownson (DD-518), was sunk by the enemy. Exploding depth charges from the sinking destroyer did not deter Daly’s intrepid captain from rescuing 168 of Brownson’s crew. Throughout most of 1944 the ship operated continuously in the combat zone. She carried her share of duties in the westward advance of Allied forces in the Southwest Pacific campaigns which included eight assault landings. Under orders to render fire support to our invading troops on Leyte, Philippines, USS. Daly began operations in the vicinity of Surigao Strait on October 24, 1944. At the same time a strong Japanese fleet was entering the lower end of the strait in an attempt to destroy the several hundred American landing craft and supply vessels in Leyte Harbor. Thus the stage was set for the opening surface action, in what later became known as the Battle of Letye Gulf, which would result in the definitive destruction of the Japanese Navy. U.S. Task Force Commander, Rear Admiral Jesse B. Oldendorf, deployed his force – battleships, cruisers, destroyers and PT boats – for what was to be the last engagement of a classic battle line formation in naval history. At about 3 a.m. on the 25th, the “tincans” commenced their firing runs. Surface fire from their 5-inch batteries was coupled with torpedo launchings. The roaring and blasting was almost continuous and the sky was illuminated by flaming streaks of light as battleships and cruisers fired over the smaller destroyers. USS. Daly and her men comported themselves with distinction. Her torpedo salvos resulted in at least three bits on an enemy battleship while her surface battery crippled the cruiser Mogami. This latter ship was finished off and sunk the following morning by American bombers. For courageously leading his men into combat and his extraordinary heroism in skillfully maneuvering his ship and directing the firing of his gun and torpedo batteries, in that historic night engagement, the commanding officer was awarded the Navy Cross. Coincidentally, that battle in Surigao Strait had taken place exactly 29 years to the date that Marine Sergeant Daly had won his second Medal of Honor. One might wonder if his ghost inspired the captain on the bridge that dramatic night in the South Pacific. Rear Admiral Richard G. Visser, a founding member of our Council, would know. He was the gallant young captain who commanded the USS. Daly. Captain Visser on the Bridge of the Daly with Exec. The directory of American Naval Fighting Ships.